Let It Snow! Let It Snow! Let It Snow!" 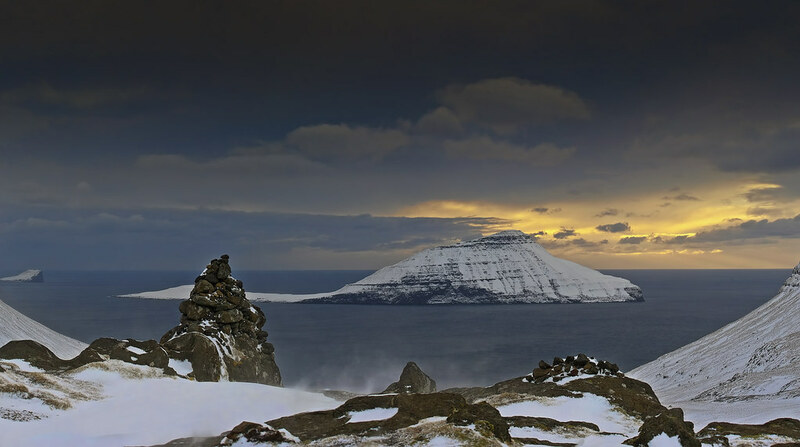 The weather in the Faroe Islands right now is certainly a little frightful, with 74m/s winds recorded. That's 260km/h! Nearly a world record. After a few hours' rest on Christmas Eve, the near record-breaking storm is now back with renewed strength for Round 3. While the storm is wild, brushing our houses and pushing waves bigger than tall storehouses into our villages, the Faroese remain calm. We know our houses are strong, built to last for centuries, and to withstand the strongest of storms. Wishing everyone a Merry Christmas from the Faroe Islands! The archive photo of the huge storm waves in the village of Viðareiði is taken by Jóannis Sørensen. UPDATE: No casualties and only minor material damages, but the numbers are a bit scary: The gust wind speeds recorded at Norðadalsskarð (225 meters over the ocean level) were 74 meters per second when this post was made. Later we recorded wind speeds of up to 78.8 m/s. That´s more than 283 Km/h. According to Wikipedia the world record in 1-minute sustained winds speeds were recorded at Typhoon Haiyan/Yolanda in the Philippines 2013 at 87.5 m/s. That is 315 km/h. Bei den 78,7 m/s (283,3 km/h) Wind, die auf dem Norðadalsskarð gemessen wurde, handelt es sich aber um eine Windböe die von der dortigen automatischen Messstation von Landsverk am frühen morgen um kurz nach 6 Uhr am zweiten Weihnachtsfeiertag 2016 registriert wurde (es handelt sich nicht um ein 1 Minuten-Mittel oder ähnliches). Der Norðadalsskarð ist 270 m hoch und von der Passhöhe hat man einen der schönsten Ausblicke der Färöer (durch das U-Trogtal Richtung Koltur). Der schöne Blick - etwa so? Wir mussten sturmbedingt fast das Weihnachtsessen absagen, weil kein Strom fuer den Ofen da war.